I took this shot of an Orangeman while covering the annual Drumcree parade in Portadown, Northern Ireland. With approximately 75,000 members, the Orange Order is the largest Protestant organisation in Northern Ireland. It dates back to the 17th century, when the organisation was formed near Loughgall in County Armagh as a result of a battle between Catholicism and Protestantism for supremacy. The name is derived from Protestant Prince William of Orange, who defeated King James II and his Catholic army at the Battle of the Boyne in 1690. You can read more about the Orange Order and its history at http://news.bbc.co.uk/1/hi/northern_ireland/1422212.stm. Every year, the Orange Order holds a parade in Northern Ireland. It is a hugely important day for Orangemen and women who value their right to parade deeply. Tens of thousands of Orangemen and supporters used to attend this parade, but over the years it has drawn fewer and fewer people. I wanted to show that this decline in numbers and the lessening of support for the parade. I did so by showing a lone Orangeman against a dark, heavy sky. During this annual parade, the Orange Order marches through different areas of Northern Ireland. Many of the areas they pass through are have Nationalist sympathies and, as a result, they are not exactly greeted with open arms. There are often lots of protests and people blocking the roads. As a press photographer, you always have to be on your guard, especially when covering events that have the potential to turn troublesome. Things can flare up within two or three seconds so you have to be alert at all times. It is crucial to know how to get in and out of a situation safely. A lot of the assignments can be very dangerous, so you have to be able to judge the atmosphere and mood of the place. In situations where there is a potential for trouble, it?s a case of relying on your sixth sense; a lot of the time you try to remain as invisible as possible. On this day storm clouds were brewing in the distance and there was strong light falling on the Orangeman and illuminating his face. I wanted to use the dramatic light and sky to sum up the drama of the parade. I took this image on my Canon EOS-1D Mark II camera with a 24-70mm lens, and I was zoomed in as far I could go. I wanted the Orangeman to stand out as much as possible and not be lost against the background. To do this, I needed to shoot from a low angle. By getting down low and looking up at the subject I could frame him effectively against the sky and create a sense of drama: where is this man looking? What is he thinking? This image poses a number of questions. To get the low angle, I had to get down and shoot from a ditch ? you can see the bracken at the top of the ditch in the immediate foreground. There was an electric fence running around the ditch, and at one point I touched it and it knocked me back. My colleagues saw me disappear into the ditch and wondered what was going on! I composed the shot so my subject was at the edge of the frame and the flags were in the centre. His pensive expression adds to the atmosphere. By showing the isolated figure against the storm, I was able to emphasise the literal and metaphorical turmoil of the times. 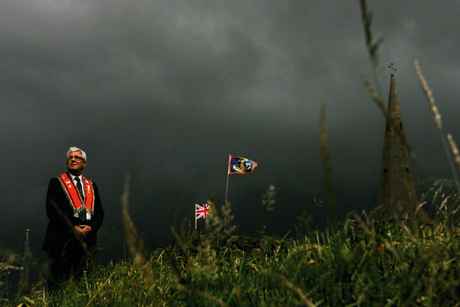 The orange of the man?s clothes and the coloured flags look even brighter against the dark, oppressive sky. These splashes of colour help to draw the eye into the scene. I used a really fast shutter speed of 1/6400sec at f/7.1 to make the sky even darker and to bring out the dramatic clouds.